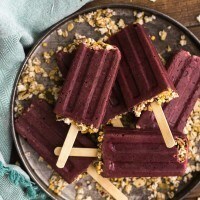 Spinach Berry Popsicles with Cereal | Naturally.Spinach Berry Popsicles with Cereal | Naturally. In a blender, combine the spinach with berries, banana, yogurt, and almond milk. Puree mixture until smooth. In a 6-popsicle mold, sprinkle roughly 1 tablespoon of cereal into each mold. Pour the berry mixture into the molds, stopping with about 1/4″ to 1/2″ from the top. Sprinkle another tablespoon or so of cereal over the berry mixture. Set popsicle sticks in and freeze for 4 or more hours, until the popsicles are set. If needed, run the molds under lukewarm water for 15 or seconds to loosen the popsicle. Serve within a day or two so that the cereal is still crisp.